The compensatory mitigation mandate opens a dynamic arena for landscape architects. 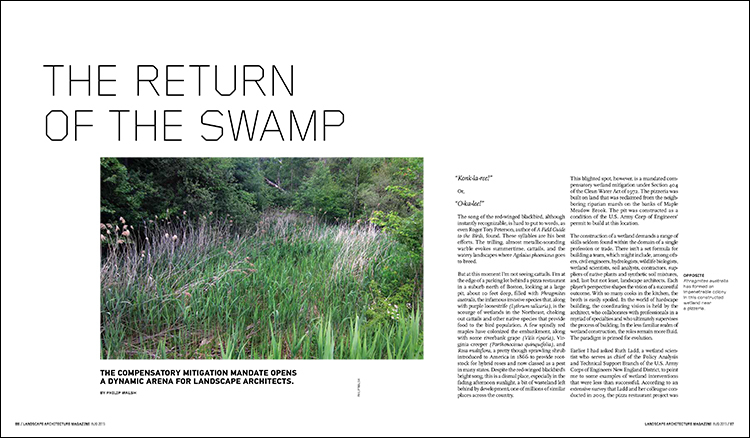 From the August 2015 issue of Landscape Architecture Magazine. The song of the red-winged blackbird, although instantly recognizable, is hard to put to words, as even Roger Tory Peterson, author of A Field Guide to the Birds, found. These syllables are his best efforts. The trilling, almost metallic-sounding warble evokes summertime, cattails, and the watery landscapes where Agelaius phoeniceus goes to breed. But at this moment I’m not seeing cattails. I’m at the edge of a parking lot behind a pizza restaurant in a suburb north of Boston, looking at a large pit, about 10 feet deep, filled with Phragmites australis, the infamous invasive species that, along with purple loosestrife (Lythrum salicaria), is the scourge of wetlands in the Northeast, choking out cattails and other native species that provide food to the bird population. A few spindly red maples have colonized the embankment, along with some riverbank grape (Vitis riparia), Virginia creeper (Parthenocissus quinquefolia), and Rosa multiflora, a pretty though sprawling shrub introduced to America in 1866 to provide rootstock for hybrid roses and now classed as a pest in many states. Despite the red-winged blackbird’s bright song, this is a dismal place, especially in the fading afternoon sunlight, a bit of wasteland left behind by development, one of millions of similar places across the country.